Anaxagoras was a Pre-Socratic Greek philosopher. 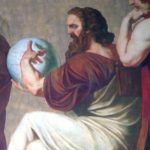 Born in Clazomenae in the Persian Empire (modern-day Urla, Turkey) Anaxagoras was the first to bring philosophy to Athens. According to Diogenes Laertius and Plutarch, in later life he was charged with impiety and went into exile in Lampsacus; the charges may have been political, owing to his association with Pericles, if they were not fabricated by later ancient biographers. "Men would live exceedingly quiet if these two words, mine and thine, were taken away."